FRASER ISLAND IS AN ABSOLUTE MUST SEE DESTINATION!! If you are travelling Australia or just looking for an ultimate camping and 4wd adventure then Fraser Island has deadset got to be on the top of your list!! Whether it’s with your mates, Mrs or the family, there is something here for everyone!! To give you a quick rundown of our trip, we spent 2 weeks on the island, we stayed at Eurong Beach Resort and we also swagged it around to some of the more remote camps on the Island. So this is a great read for everyone because if you don’t have camping gear we show you the resort and what to explore. If you are fully setup to free camp then we show you the campsites we hit and our itinerary around the island!! So keep reading on as we will tell you all about our trip with loads of information, piccies and a few vids thrown in to show you how to get the most of your time on Fraser. If you don’t have camping gear and would be keen to hire a camper trailer, scroll down to the end of the article to check out some off-road rigs on CAMPLIFY you can hire! A highlights reel of some of the Iconic attractions on Fraser Island. We stayed at the Eurong Beach Resort while we explored these places on day trips with our 4wd. Fraser Island is the worlds largest sand island, world heritage listed and stretches 123km long. One of our highlights in three years of travel and you HAVE to put this on your bucket list!! “Take with you memories, leave only footprints”. A few days of prepping for this adventure, making sure we have enough water and food among other things, we do it all while parked up at Fraser Coast RV Park. An perfectly situated campground on a whopping 75 acres of bush. Only a 2 minute drive to the barge and a 15 minute drive into the centre of Hervey Bay. At $20 per night for your family (self contained) we thought it was the perfect place to set up and prep our car for the trip over. Plenty of space and grass here for the kids to tear around on there bikes as well as fire pits scattered for your use. This is a brand new park and the owner really is a fabulous woman(make sure you say hi from us). By the time you’re reading this the new cabin, camp kitchen and amenities will be up and running, so it really is bang for your buck! We love Hervey Bay and it has a great atmosphere. The kids favourite (and ours) was the FREE waterpark on the Esplanade. They also do a mean coffee and their fish and chips looked delicious. The beach is absolutely beautiful, water temp was perfect and safe swimming for the kids. 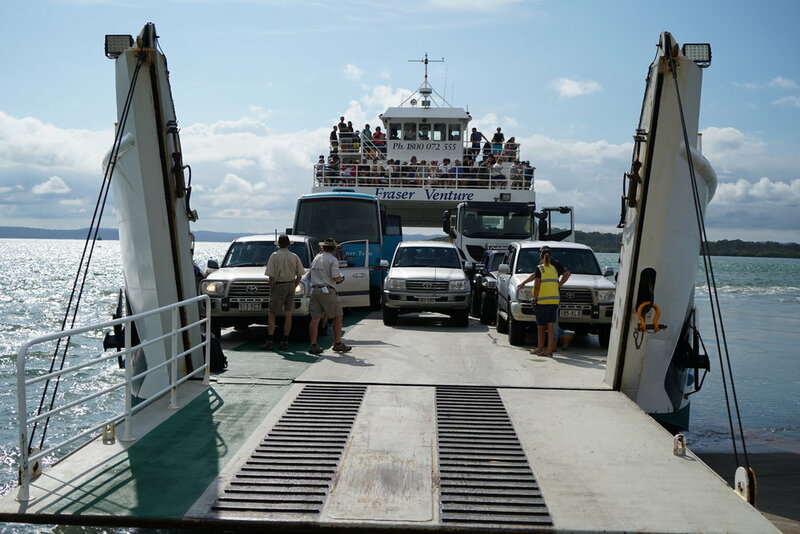 Also a great spot to stock up on anything you need before getting on the Ferry over to Fraser Island. Woolworths, BCF and Bunnings among plenty of other stores you may need before you leave your caravan. OFF TO FRASER ISLAND WE GO!!! WHALES!! Spotted straight out the front of Eurong Beach Resort. We catch the 9am Barge over and its a quick 45 minute trip across the Great Sandy Strait. This brings us into Kingfisher Bay and we decide to park up and have a look around. We take a dip in the resort pool there and its the perfect way to start our trip over to Fraser Island. The Sand Bar is open to the public and the perfect stop while waiting for your return Barge. Grab a feed, beer or enjoy a swim at the pool. We scored some cracking weather on our first day, so we decide to hit up Lake McKenzie before checking into our accommodation at Eurong Beach Resort. You drive straight past it as you head across the island, so if it’s a mint day it’s worth stopping in. To get the full lake Mckenzie experience, you really do want to hit it on a clear sunny day. Be ready for some crowds here at Lake McKenzie, it is one of the Islands biggest tourist attractions so it’s a good idea to visit before 10am and after 3pm to have a good chance of missing the tour busses. It’s fairly busy when we arrive, but we park up and grab some lunch, we missed the signs that say DO NOT EAT LUNCH IN CARPARK and sure enough a Dingo is there within seconds. We eat inside the car and later see that there is Dingo proof fencing around the picnic area. You can incur a heavy fine if doing this or feeding a dingo, so please keep this in mind. A short 120m walk down to Lake McKenzie and it really does take your breath away! Pure white sand, turquoise water and a sunny day! It really doesn’t get much better as the water temperature is just perfect and we all swim for hours before heading to Eurong. The drive from Kingfisher Bay to Lake McKenzie was around 40 minutes, so now we do the last 40 minutes to Eurong Beach Resort. We didn’t really know what to expect but what we did know was that we were excited to have a flushing toilet and a couch and seperate bedrooms for us and the kids!!! What a change from van life and we haven’t done anything like this in our three years of travel! As we open the door there are plenty of squeals and excitement from the kids as they head for the bedroom and start jumping on the beds (sorry Eurong). We have an apartment overlooking the pool with views across to the beach and we feel extremely spoilt! The accomodation is cosy, comfy and clean with it’s own fully equipped kitchen, 2 bedrooms, bathroom, a big lounge room and balcony overlooking the pool. We eat at McKenzie’s restaurant and the meals are excellent! It is a buffet menu for breakfast, lunch and dinner and oh man is it good not having to cook after a big day exploring! If you head over there, be sure to try the Butterscotch Cocktail, OH MY! So delicious and only $10 at Happy Hour! We relax at the pool for most of the afternoon, the kids crash for an early bedtime & us adults sit up and watch a full size TV and plan the next days adventures. As we are driving up the beach we spot the Air Fraser runway which takes off and lands on the 75 mile beach! We already have tickets to do this, so there and then we decide to jump onboard. I’m a little anxious and the split decision has caught me off guard. I’m so nervous about heading up in a small plane with my family. What if it crashes?! 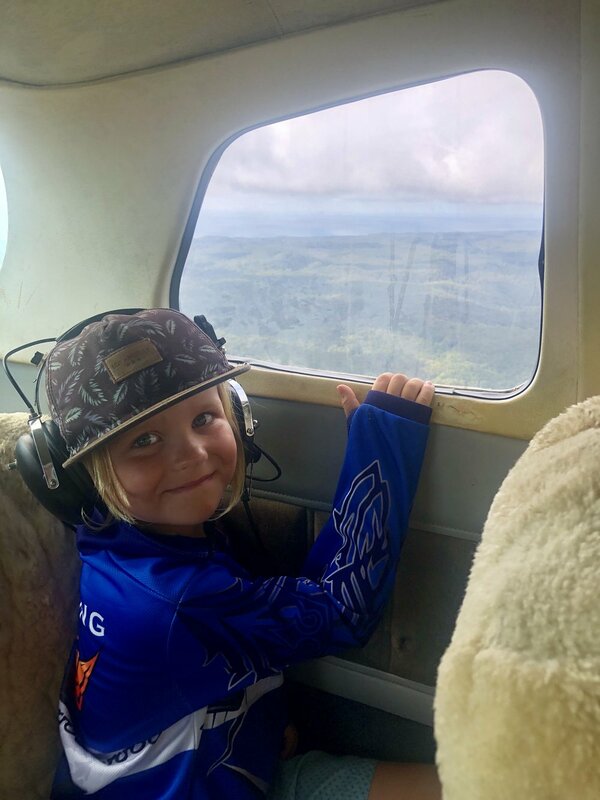 😂 I sooo overcome this when we meet the legend of a pilot Harry, what a great bloke and he assures me it will be a ripper flight…. And it was!! WOW. On board we jump. Justin takes the co-pilot seat with the kids and I in the back. The kids are beside themselves with excitement and they cant wipe the smiles of their faces. I absolutely loved watching this and its these moments when travelling that are so memorable! Up, up and away, we take off from the beach and it really was so awesome to see Fraser from the air. Strait out to see we go and back over the Island. We see Lake McKenzie from above and other hot spots like Lake Wabby. The 15 minute flight was the perfect time and we descend back down to land on the 75 Mile beach air strip. We’ve never done a flight like that together and the kids are still talking about it. Cost of the flight is from $100pp. Our next stop heading north up the Island is Eli Creek, now this one really does knock our socks off! We park our car up on the beach beside the creek, which is crystal clear, shallow and has sand dunes and forest for a backdrop. We grab our pool noodles and make our way up the boardwalk. WOW. Did you know that Eli Creek pumps out four million litres of fresh water EVERY HOUR into the ocean!!!! Therefore you can float effortlessly down this creek and enjoy the ride and tranquility. Another epic destination that we all loved to bits! We spend just about all day here and after some lunch and another few swims/floats we realise we’ve had too much sun and everyone is tired! As soon as we get in the car our girl Charli is asleep within seconds, its a hard life for a three year old. We head north another couple of kilometres to view the SS Maheno. What a sight! Justin and I walk around it and read about the shipwrecks history. Another magic day on Fraser Island and we head home. We head over and tackle the Worlds Largest Sand Island!! Over the next 4 episodes we spends 2 weeks exploring Fraser and show you the Hotspots, Resort stays and remote camping on offer. This place is an absolute Jewell in the QLD Crown of holiday destinations and we highly recommend heading over with your mates, your Mrs or your whole family! We are keeping an eye on the weather as we’re supposed to be getting some thunderstorms roll through this afternoon. The morning is beautiful though, so we head for Lake Birabeen. Its about a 40 minute drive from Eurong and in the meantime it’s become very overcast and glary. We had seen some absolutely beautiful photos of Lake Birabeen and we have heard it’s just like Lake McKenzie, only less touristy. But for us on this rainy day, it didn’t live up to its hype. Still a lot of fun mucking around in the Lake though. How cute is Dad and his kids - so special. However, I wish the littlest one would keep some darn clothes on #vanlife. Dad’s are heaps fun! Lake Birabeen. Not much to say……It’s bucketing down rain, so we have a pretty chill few days. When the rain eases the kids head to the pool for a swim and to burn off some energy, however the rain is relentless. How lucky we are to be in a room at the Eurong Beach Resort. The kids lap up some rainy day movies and all sit in bed watching TV, a very rare occasion and Justin and I are loving the peace and quiet. We pack up all our gear from the room, load it back into the car and Leave Eurong Beach Resort headed for our first campsite north of Orchid Beach⛺️. Gosh, we have loved our time here. A fantastic location to explore the hotspots and still have the ‘at home’ luxuries. Highly recommend this place if you’re heading over to Fraser. We head north up to Cathedrals On Fraser to take a look in there. We stop in at the cafe and have the most delicious hot chips and wait for low tide. A full dingo-fenced campground with toilet and shower facilities, a general store, fuel, bottle shop and laundry facilities. A good spot to stop into on your way north. Also a great place to stay when on Fraser Island for camping or cabins. We head another 40 minutes north and check out Orchid Beach. Another place to grab some essentials from the general store, a bite to eat at the Cafe or fuel up your rig. It’s also your last place for phone reception, so here we book our camping zones for the next few days. Just north is the Marloo Camping Zone, we’ve done enough driving and decide to pull up at a beach campsite. Set in the dunes with some protection from trees and shrubs - this is us for the night. It’s our first night in the swags and we’re all very excited to test them out and sleep under the stars. The kids all pitch in and help set up camp. We always make a point of this as it’s important to instil some work ethic and teamwork. We are set up in no time! IN THIS SERIES OF VIDEO'S - We head over and tackle the Worlds Largest Sand Island - FRASER!! Episode 2 - We head off to swag it around the Island. We show you our campsite at Marloo Bay, some camping tips for packing your fridge & we hit Ngkala Rocks on our way up to one of Fraser's most remote campsite's Sandy Cape!!!! We have just picked up some new gear from ARB for our trip to Fraser island! The Swags, Swag bags and mesh flooring is going to make camping around the island a blast!! Check out the vid to see how we set up the Skydome double swags and how they mount to the Rhino Rack platform on our Mazda BT50. After a great nights sleep we pack up camp, our 2 SkyDome ARB double swags and head north to Sandy Cape. On your way up to the Sandy Cape there is one tricky track that you will encounter and depending on conditions it can be a tuff one to get through.. The Ngkala Rocks bypass track is famous for being a shocker, but lucky for us it’s just an easy crawl through a bit of water crossing through some coffee rock and then some soft sandy tracks and we are back on the beach again heading for our camp. Once we hit this part of Fraser, we are amazed at how beautiful it is. Massive pure white sand dunes and lovely blue water, we’ve hit the jackpot. Plenty of campsites to choose from, we find ‘the one’, park up and set up our camp. NGKALA ROCKS TRACK ON THE WAY TO SANDY CAPE!! The kids are dying to play on the sand dunes so after some lunch we head here. They spend so much time here running up and down and back up the sand dunes. What a work out and I’m feeling my legs burnnn. We arrive back at out campsite to find some backpackers have parked up right next to us. There are plenty of other campsites available but for some reason they park up next to us. I think we need to write a campground etiquette book, so many people just don’t get it!! Anyway, all is good and we get on with our day. Justin has a fish and we enjoy the gorgeous sunset while playing some footy. What a way to end the day. Now one thing we forgot to do and we cant believe it, is the the LIGHTHOUSE!!! It was on our list of m just see things and we were literally camped only 20 minutes away.. We were just so stoked at the camp and hanging on the beach that it totally slipped our mind. Make sure you get up there because it looks AMAZING!! IN THIS VIDEO SERIES - We head over & tackle the Worlds Largest Sand Island - FRASER!! Episode 3 - We camp up at Sandy Cape and show you the campground up there. Some good tips and then we head over to Wathumba for another great night in the swags. Kids loved the ARB Swags. Too much excitement at bedtime. We pack up camp and decide to head over to the Western side of Fraser and spend our time there. Before we head south dow the beach, we park up and play on the sand dunes and have a swim in the lagoon that is formed right at the tip of Sandy Cape. 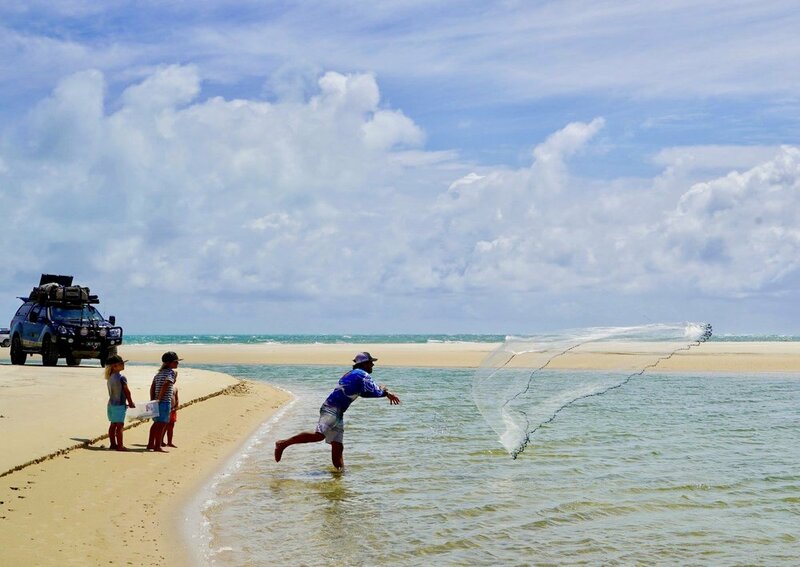 Justin gets a heap of bait fish in the cast net and this keeps the kids very entertained catching all the small fish! Using the cast net at Sandy Cape. Wathumba Creek is where we are headed and we take the inland track from the eastern side. It’s about a 30 minute easy drive through to the western side. A beautiful drive through changing landscapes from eucalyptus to rainforest and we pop out at Wathumba Creek and WOW! The creek is on high tide and it’s the clearest of water, an amazing blue and the sand is super white. We park the car up on the beach and swim for hours! Justin wades the sand flats and has a fish, loses a flathead and catches a few bream for dinner. We set up our swags on the beach only 10 metres from the creek. It’s perfect, the sun sets right in front of us and we cant believe this amazing campsite. The kids swim right up to sunset. Beware of the midgies however, the are pretty bad at dusk and dawn, take plenty of aeroguard and mozzie coils, this seems to do the trick for us! Jack lost his second tooth at Wathumba. Jack also loses his second tooth and the tooth fairy forgets to come…. We feel so bad and tell him that the tooth fairy is taking ages to get over to Fraser from the mainland. Thankfully he is understanding! TIP: Visit Wathumba on high tide if you are just day tripping. Not that great on low tide. We pack up and head back across the inland track to Orchid Beach where we fuel up (diesel $2.34Litre) 😳 grab some beer, bread and milk. (carton of XXXX Gold $79) Then we head for Champagne Pools, an iconic attraction on Fraser Island. The waves crash over volcanic rocks causing the water to bubble like champagne. Boy was this place fun! We hit it on low tide and for us this was perfect. Great swimming for the kids and the waves weren’t to powerful, however the kids LOVED getting “smashed” by the waves. Definitely a highlight of our trip. After some lunch we hit the tracks and head to Awinya Creek which we have heard good things about! Just south of Cathedrals on Fraser you will find Woralie Rd which takes you across to the western side of the island and some off the more remote beach camps. The track takes about an hour and as we descend down the last dune onto the beach to see the amazing blue ocean, all we can say is WOW! !👌To get to the camping zone you need to cross Awinya creek so plan your trip to get there at low tide, it can get fairly deep on big tides. This place blows our minds, it’s simply beautiful and we feel like we’re in the Maldives (not that we’ve been)! We find a spot amongst a few trees in between the creek and beach on amazingly soft white sand. The beach is clear aqua blue and the fresh water creek behind us is just perfect. We spend our days going from the salt to the fresh and back again. This has been one of our favourite campsites around Australia. For those who are keen on fishing, check out the video below. We give Drone Fishing a go for the first time and it’s so easy and so much fun!! For more info, check out our article here. It didn’t matter what time of day it was here at Awinya Creek, the place was just stunning. If your after a remote beach camp experience for your family, then you cant go past it hey. We spent 2 nights here, but could have easily stayed a week and thoroughly relaxed.. TIP: Check tides as the creek can be impassable on high tide. Today is our last day on the island and we are sadly leaving Fraser but with a mountain of magic memories and pictures to look back on. It has been such a fantastic trip, starting in the resort and being spoilt to bathing in creeks, lakes and the ocean. 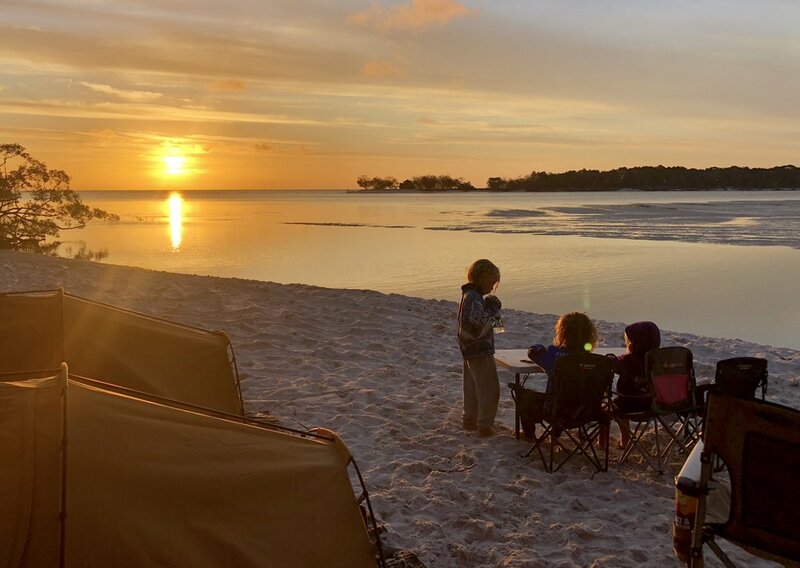 Sleeping in swags with sandy feet at the most EPIC of campsites and trying to find a private spot to sit on the porta loo.😂😂 The most wicked sunsets, amazing attractions, fishing and just a whole lot of fun. This really does need to be on your bucket list of places to visit! For us, it’s time to get back to van life and start heading south. Fraser Island you are definitely a place that has been memorable to our family and a stand out location in our past three years of travel. Floating in the beautiful waters of Fraser Island! Bring a stash of gold coins to treat yourself to a hot shower at the end of the day -some campgrounds have facilities. The laundromat at Eurong Beach Resort is open to the public. Dingo’s - Keep kids close by and keep food packed away, as well as your bin. Time your day trip on low tide, makes for a good run up the beach. Swags are an awesome option when touring the Island. We can highly recommend the ARB SkyDomes, comfortable and easy to set up/pack up. Bring a portable toilet if your remote camping. We think they are such a great idea to keep campgrounds clean. Make camp cooking easy and get yourself some Campers Pantry meals - YUM!! Scroll down to watch a vid on the meals. We took a range of these meals away with us on our camping trip to Fraser Island and we are very impressed with the quality, the size & the taste of them. So easy to make, just add boiling water, stir and wait 20 minutes. Are you looking to experience Fraser Island for an affordable price but don't have anything to sleep in? We went with swags but you can hire a camper trailer from Camplify. These campers are family friendly and allow plenty of room so you'll have a comfortable and enjoyable holiday! They are also fully insured for off-road locations. 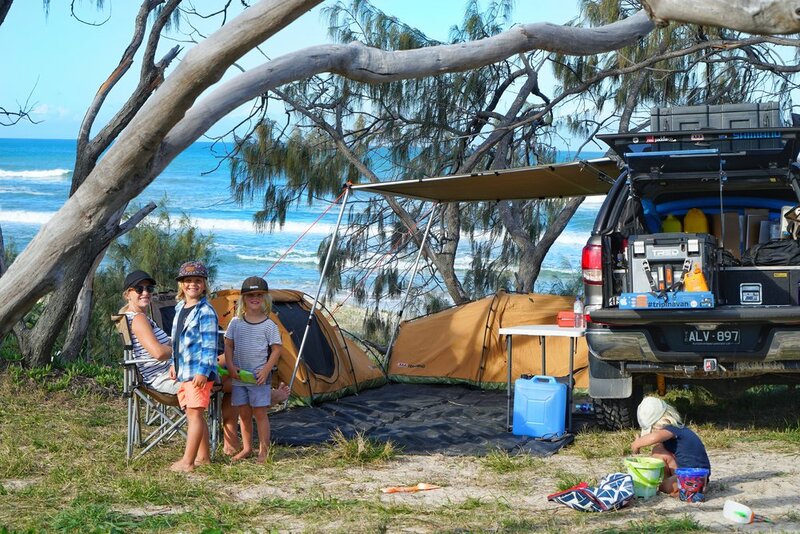 Below are links to 5 camper trailers that are available for hire on Fraser Island.